DANIEL DOOLEN was born about 1765 in Ireland. We don't know where the family came from. Maybe they came from Doolin, Clare County, Ireland. 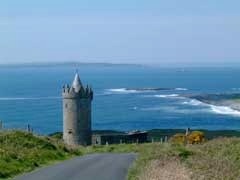 There is a Doolin castle there, however, the castle maybe just named for the area. About 1788, after the Revolutionary War, Daniel came to America with his 3 brothers, John, Hardin and William and settled in Georgia where Daniel & John appear in early Wilkes & Franklin county records. The brothers separated soon afterwards. The percentage of Irish among the settlers of Georgia in those days was very large. There had been a very large group of Irish settlers who came to Georgia in 1768. Daniel married MARY BRIDGES who was born about 1769 in North Carolina. Mary was the daughter of a Revolutionary War soldier John Bridges and Elizabeth Murray. Mary was a small dark-haired woman with dark complexion, dark brilliant eyes, and aquiline nose (curving, like an eagle’s beak). During her childhood, she and her mother and younger brothers and sisters, in the absence of their father, were driven from their home in winter and the house was burned by the Tories. The exposure brought blindness to Elizabeth who had a "babe in arms." 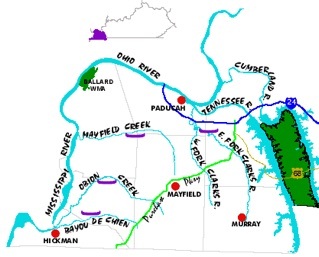 In 1800 Daniel "Dulan" was in Ohio Co., Ky (which was later Butler Co.) In 1810 they were in Butler Co., Ky., then later moved to McCracken Co., Ky. His brother, William was in Butler Co in the 1830s and in McCracken Co in the mid 1840s. ......2c) Alfred Murray Doolen, b 8-9-1825, McCracken Co., Ky.; m 11-9-1843 to Mary Ann Pruett; d 1888, Marion Co., Ill.
Nancy was born about 1798, Ky; married Anderson Helms, July 30, 1829. Rachel was born about 1802, Ky; married ? Belew; died in Ky.
......7d) Thomas P. Doolen, born May 14, 1841, IL; married 1st Eliza McQuality (Mar 24, 1860) & 2nd Anna Flora (Sept 30, 1860, Brown Co., IN); died Oct. 28, 1915, Macon, IL; Civil War, Co K, 152 Ill. Inf. ......7h) Alfred Murray Doolen, born Dec. 12, 1844, IL; married 1st Mary Josephine Dickson (probably a full Cherokee Indian) & 2nd Ellen Meaders Stafford (Nov. 18, 1891, Hickory Co., Mo); was in the Civil War, 32nd Ill. Inf. ; died Oct. 13, 1920, Coyle, OK; buried Lincoln Co., Ok., in Oak Grove Cemetery. Oklahoma was still a territory when the Doolens settled in Oak Grove and Stroud area. Alfred Murray & Mary Josephine Dickson (Dixson) had five daughters: Florence, Carrie Etta, Millicent, twin girls Maude and Minnie. #8 or maybe #2?–(name unknown), born about 1809, Ky; died Mayfield, Ky.
......9a) Martha Doolen, born Aug. 13, 1837, Ill., married Feb. 23, 1854 to John Barbe Morgan (1829-1913, son of John Deskin Morgan); died July 13, 1900; buried North Fork Cem. ......9c) Lucinda Doolen, born Jan. 26, 1841, Ill. ; married Fletcher Arnold (1860) & John Wall (1867); died May 27, 1911. ......9d) Benjamin Doolen, born Feb. 23, 1843, Ill.; married Laura Ann Jakes, Sept. 30, 1860; died Mar. 1, 1926; buried North Fork Cem. ......9g) George W. Doolen, born Jan. 26, 1850, Ill.; married Sophia Swearinger, Aug. 9, 1877; died July 6, 1881, Navarro Co., Tx. ......9i) James Daniel Doolen, born Sept 3, 1854; died Oct. 11, 1854 (age 1 month)–buried North Fork Cemetery.